Pippa offers a FREE first / introductory lesson! I am currently studying for a BMus Honours degree in Trumpet performance at the Guildhall School of Music and Drama in London with Paul Beniston and Phil Cobb. I have had previous experience playing for 3 years in the National Youth Orchestra of Great Britain and very grateful to have had the opportunity to play in venues such as the Royal Albert Hall in the BBC Proms. Having originally started playing from a brass band background, I have also had the opportunity to play for the prestigious Blackdyke Band having previously held principal cornet of my hometown band, Beaumaris Band in North Wales, and the National Youth Brass Band of Wales. 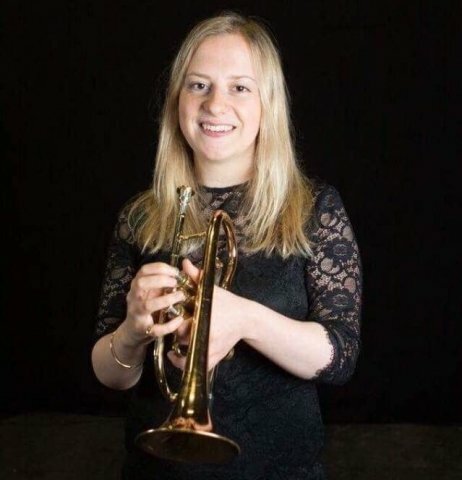 I have previous experience of teaching Cornet at beginner level and have previously participated in sectionals at the National Youth Orchestra Inspire events where I was helping players beginners to advanced across the UK in both chamber and orchestral settings. I have a fun and friendly approach to teaching with the ultimate aim for pupils to grow in confidence both as a musician but also as a person. I want to motivate pupils to strive to reach their full potential musically in a positive, structured learning environment.